Our oven has been dead since November 4th. That makes it hard to roast a turkey. So how do you face a major roasting/baking holiday like Thanksgiving without a working oven? It’s not the kind of thing you can borrow from a neighbor very easily. The easy answer is, of course, to get yourself invited to someone else’s house for the day! One of my siblings lives in Massachusetts, and we love having an excuse to go see them. This was the perfect occasion (thanks for the generous invitation! ), so I offered to bring anything I didn’t have to bake: cranberry sauce, green beans, Martinelli’s sparkling cider, Polar peach seltzer, etc., and 2 pies. (Whoops- did she say pies?) Yes, I did. 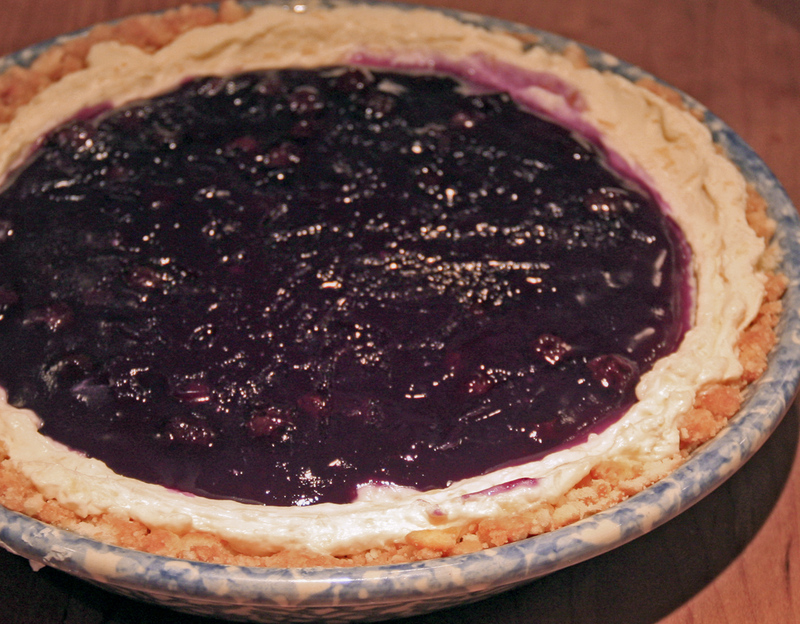 I do love baking pies, but I also love a challenge, so I went looking for some good no-bake pie recipes. I had to use my imagination to figure out if they would be any good, and in the end I liked them very much. I might make a few changes next time (not so much pineapple? cook the fudge to a softer consistency? remember to bring the extra box of cream cheese? ), but overall I can definitely recommend these delicious recipes. I give you two very different layered, no-bake, “ice-box” pies. Mix together and press into 9″ pie plate. Refrigerate. Mix together, spread over crust, refrigerate. Blend sugar, salt and starch in a saucepan. Combine liquids of pineapple and blueberries and add water if necessary to measure 1 1/2 cups. Blend liquids into dry ingredients in pan. Cook and stir until thickened. Stir in blueberries and lemon juice. Cool. Pour over cream cheese layer and chill thoroughly. Top with whipped cream before serving. Melt the butter and chocolate chips in the microwave in 15-second intervals. Blend with the cookie crumbs and press into a deep-dish pie plate. Refrigerate. In a medium saucepan, cook sugar, chocolate, milk, corn syrup together, stirring occasionally, to the soft ball stage or 234º-240º on a candy thermometer. Remove from heat, stir in peanut butter. Beat lightly for a few minutes, then pour into crust. Chill thoroughly. In a large mixing bowl, beat cream cheese with peanut butter, powdered sugar and milk. Fold in whipped cream until well-blended. 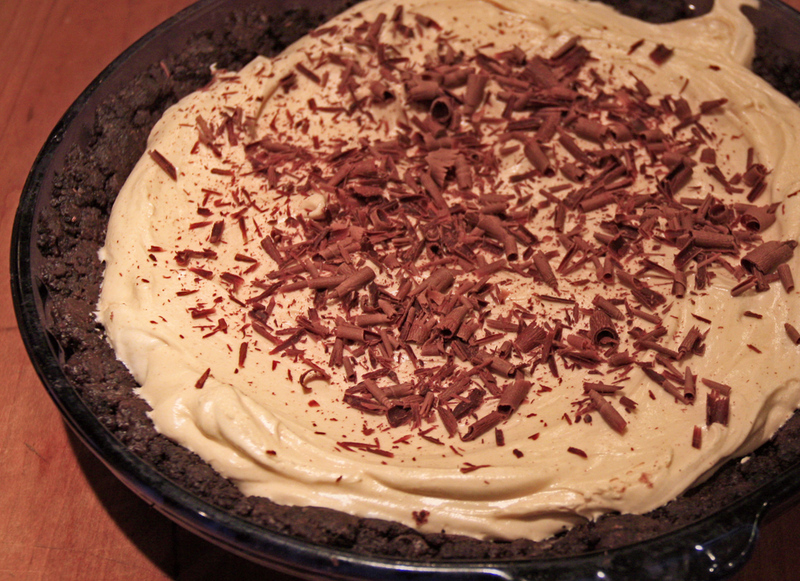 Spoon into fudge layered pie crust and garnish with chocolate curls (run a vegetable peeler along the edge of a chocolate bar). Chill before serving. P.S. A new oven is on order. I look forward to its arrival in 17 days. P.P.S. I apologize for the Google ads. I only just discovered them. Apparently they are only on some posts and then only visible to those not logged in to a WordPress account (which is most of you, presumably, but not me). Please try to ignore them whilst I research a solution. Thank you. This entry was posted in Autumn, Recipes, Regarding Food by Maren. Bookmark the permalink. The pies look delicious. But I can’t imagine being without an oven for so long; you obviously have a much deeper cooking repertoire than I do. I’m impressed! One of the best turkeys I ever had was one Dave grill roasted on our gas grill, I think it was even snowing outside that year. But that wouldn’t be very convenient in Vermont. Thanks for the pie recipes! You rock. I made two baked pies and they were dumb. I know yours were way better. The kids still talk about the peanut butter one. Yum. The blueberry was ok, and would probably be better in summer. What did you make? I’ll bet they were NOT dumb.